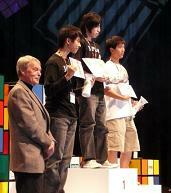 Yu Nakajima won the World Rubik`s Cube Championship 2007 with an average in the final of 12.46 seconds. Andrew Kang finished second (13.05) and Mitsuki Gunji finished third (13.05). World records: Mátyás Kuti 5x5 1:45.07 (average), Ryan Patricio 3x3 one-handed 21.13 (average), Lukasz Cialon 2x2 3.91 (average), Erik Akkersdijk Megaminx 1:17.46 (single) 1:19.16 (average). Asian records: Shotaro Makisumi 3x3 blindfolded 1:39.56, 2x2 2.82 (single), Mitsuki Gunji 3x3 one-handed 18.06 (single), Yumu Tabuchi 3x3 fewest moves 37, 4x4 blindfolded 12:58.10, Bernett Orlando 5x5 blindfolded 55:39, 3x3 multiple blindfolded 3 cubes in 27:04. Australian records: Peter Still Magic 2.91 (single) 3.17 (average). European records: Tomasz Zolnowski 5x5 1:42.51 (single). North American records: Andrew Kang 3x3 13.05 (average), Bob Burton Clock 18.04 (average). South American records: Pedro Santos Guimarães 3x3 13.00 (single) 16.67 (average), 4x4 1:22.02 (single), 3x3 blindfolded 2:08.97, 3x3 one-handed 26.47(single) 27.30 (average). Ganyuan Jiang won the Guangdong Open 2007 with an average in the final of 15.40 seconds. Timothy Sun finished second (16.30) and Yi Wei finished third (16.71). World records: Enxi Xie youngest Rubik`s Cube solver 4 years 6 months 10 days. Asian records: Chan Tak Chuen Magic 1.58 (average). Australian records: Joshua Li 3x3 16.33 (single) 18.10 (average), 4x4 1:17.93 (single) 1:31.55 (average), 5x5 2:20.54 (single) 2:39.24 (average), 2x2 5.38 (single) 10.13 (average), 3x3 one-handed 22.75 (single) 27.08 (average). North American records: Timothy Sun Magic 1.02 (single) 1.12 (average). The Caltech Fall competition 2007 will take place on November 10, 2007 in Pasadena, California, USA. Check out the Caltech Rubik`s Cube Club website for more information and registration. The Ibaraki competition 2007 will take place on November 17, 2007 in Ibaraki, Japan. Check out the Ibaraki 2007 website for more information and registration. Yung-Chi Chen won the Taiwanese Championship 2007 with an average in the final of 14.85 seconds. Ming-Hao Kang finished second (15.05) and Yueh-Lin Tsai finished third (15.72). The Minnesota Open 2007 will take place on October 27, 2007 in Rochester, Minnesota, USA. Check out the Minnesota Open 2007 website for more information and registration. Piotr Kózka won the Polish Open 2007 with an average in the final of 14.09 seconds. Tomasz Zolnowski finished second (14.36) and Ron van Bruchem finished third (15.38). World records: Mátyás Kuti 4x4 58.15 (average), Clock 8.60 (average), Master Magic 1.96 (average), Lukasz Cialon 2x2 3.92 (average), Grzegorz Luczyna Pyraminx 5.98 (average), Grzegorz Prusak Square-1 13.56 (single) 19.57 (average). The Spanish Championship 2007 will take place on November 24, 2007 in Barcelona, Spain. Check out the Spain 2007 website for more information and registration. The Taiwanese Championship 2007 will take place on September 23, 2007 in Taichung, Taiwan. Check out the Rubiks.tw website for more information and registration. Jean Pons won the Lyon Open 2007 with an average in the final of 12.71 seconds. Edouard Chambon finished second (13.20) and Joël van Noort finished third (13.95). African records: Etienne Amany 3x3 19.68 (single) 21.28 (average), 3x3 blindfolded 5:22.50 (single). European records: Rama Temmink 3x3 one-handed 21.86 (average). The Guangdong Open 2007 will take place on October 1, 2007 in Guangdong, China. Check out the Guangdong Open 2007 website for more information and registration. The Pleasantville Fall competition 2007 will take place on November 3, 2007 in Pleasantville, New York, USA. Check out the Pleasantville Fall 2007 website for more information and registration. Milán Baticz won the Swedish Open 2007 with an average in the final of 14.83 seconds. Mátyás Kuti finished second (15.39) and Gunnar Krig finished third (15.60). World records: Milán Baticz Master Magic 2.09 (average), Maté Horváth Master Magic 1.83 (single). European records: Mátyás Kuti 3x3 one-handed 22.23 (average). Mateus Moitinho de Almeida won the Philippines Open 2007 with an average in the final of 16.23 seconds. JB Cañares finished second (16.36) and Chia-Wei Lu finished third (19.40). Ryan Patricio won the Caltech Summer competition 2007 with an average in the final of 13.47 seconds. Shotaro Makisumi finished second (13.51) and Dan Dzoan finished third (14.65). North American records: Ryan Patricio 3x3 13.47 (average), Frank Morris 5x5 1:41.64 (single) 1:50.60 (average), Michael Gottlieb Pyraminx 8.54 (single) 9.57 (average). Sinpei Araki won the Kanazawa Open 2007 with an average in the final of 15.28 seconds. Takuma Akutsu finished second (15.40) and Kento Hirayama finished third (15.83). Anssi Vanhala won the Finnish Open 2007 with an average in the final of 15.43 seconds. Johannes Laire finished second (15.57) and Teemu Tiinanen finished third (19.58). World records: Anssi Vanhala 3x3 with feet 39.88 (single) 52.46 (average). Lee Chan-Ho won the KCRC Busan competition 2007 with an average in the final of 13.79 seconds. Yu Jeong-Min finished second (14.32) and Kim Jun-Beom finished third (14.61). Asian records: Kim Hyung-Sub 4x4 1:04.44 (average), Syuhei Omura 2x2 3.66 (single), Choi Go-Ho Megaminx 1:38.43 (single) 1:44.23 (average), Square-1 34.56 (average), Kim Hyun-Gyum Pyraminx 7.18 (single). Edouard Chambon won the Murcia Open 2007 with an average in the final of 12.36 seconds. Thibaut Jacquinot finished second (12.57) and David Calvo Vivas finished third (16.20). World records: Thibaut Jacquinot 3x3 one-handed 15.81 (single). European records: Edouard Chambon 3x3 12.36 (average), 3x3 one-handed 23.89 (average). The German National Championship 2007 will take place on October 20, 2007 in Essen, Germany. Check out the Germany 2007 website for more information and registration. The Dutch Open 2007 will take place on October 13/14, 2007 in Eindhoven, The Netherlands. Check out the Dutch Open 2007 website for more information and registration. The Caltech Summer competition 2007 will take place on August 25, 2007 in Pasadena, California, USA. Check out the Caltech Summer 2007 website for more information and registration. The UK Open 2007 will take place on November 10, 2007 in Birmingham, United Kingdom. Check out the UK Open 2007 website for more information and registration. Mitsuki Gunji won the Japan Open 2007 with an average in the final of 13.13 seconds. Yu Jeong-Min finished second (13.36) and Yu Nakajima finished third (13.66). World records: Takayuki Ookusa 5x5 1:38.78 (single) 1:50.01 (average). Asian records: Yu Jeong-Min 3x3 10.55 (single), 3x3 one-handed 23.60 (average), Syuhei Omura 2x2 5.14 (average), Teruki Miyazaki 4x4 blindfolded 38:58 (single), Hideaki Tomoyori 3x3 oldest solver 74 years 9 months 28 days. Erik Akkersdijk won the Czech Open 2007 with an average in the final of 13.17 seconds. Mátyás Kuti finished second (14.58) and Joël van Noort finished third (15.15). World records: Mátyás Kuti 2x2 2.73 (single) 4.13 (average), Clock 7.69 (single) 8.83 (average), Grzegorz Luczyna Pyraminx 6.19 (average). European records: Mátyás Kuti 5x5 1:52.63 (average).